Note: One of the most common operations in all of orthopaedics, and not just sports medicine, is a partial meniscectomy, or surgery to trim a meniscus tear. I have noticed in my clinics over the last few years that there are several questions asked by most patients with these injuries. I decided it might be helpful to answer them in a blog post. The meniscus is a C-shaped piece of shock-absorbing cartilage between the femur and the tibia in the knee. There is one on the medial side (side closest to the midline of the body) and one on the lateral side of each knee. How do you tear the meniscus? Typically an athlete or active individual tears a meniscus with a twisting injury. Younger athletes often suffer more significant injuries than do older adults. Often older athletes will note feeling pain after squatting to pick something up or another seemingly innocent maneuver. Occasionally older patients do not remember a specific injury at all. How can I tell if my knee pain is caused by a meniscus tear or prior arthritis? Note the fissuring and fraying of the articular cartilage lining on the end of the femur. This distinction is critically important in treating meniscus tears in adults. Often degenerative meniscal tears occur with pre-existing arthritis changes of the knee. It is important for the surgeon to determine if the meniscus tear mostly causes the pain. Surgery for the meniscus tear is very successful for relieving these symptoms. On the other hand, we know from several studies done over the last decade that surgery to “clean up” arthritis changes has little long-term benefit. It can be difficult, though, to determine the true source of knee pain in older athletes. 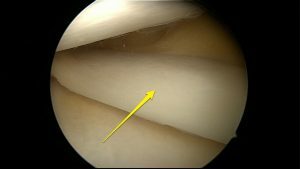 Often meniscal pain is more focal and specifically located in a small area on the side and toward the back of the knee. Arthritis pain is often more diffuse, generalized discomfort. Also arthritis might improve somewhat with anti-inflammatory medications, braces, injections, and other nonoperative treatments. Pain from meniscus tears, however, often does not improve with anti-inflammatory medications or even cortisone or viscosupplementation injections. 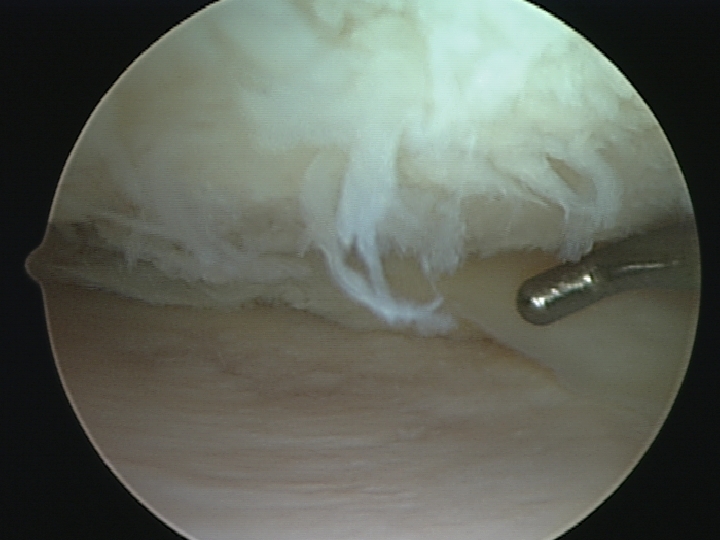 Surgery to treat a meniscus tear in the setting of arthritis can still have benefit if the patient understands that there may be lingering pain related to the arthritis after full recovery from the meniscus tear. It is vitally important that patients discuss these possibilities with their surgeons. Could the pain from a meniscus tear go away on its own? We know from several studies looking at MRI findings in adults with no knee pain that a small percentage of the population has meniscus tears and doesn’t even know it. That finding suggests that some meniscus tears are not painful. Unfortunately, it is difficult to predict whether a patient with a painful meniscus tear will get relief of that pain from ice, rest, anti-inflammatories, or physical therapy. I think that nonoperative treatment is always a reasonable option. At some point, though, if a patient is not able to perform the activities that he or she would like, surgery can often relieve pain. What does a partial meniscectomy surgery involve? While some meniscus tears can be repaired (sewn back together), most require the inner, torn part of the meniscus to be removed. The surgeon uses small scissors and a shaver placed through small arthroscopic portals to perform this partial meniscectomy. Watch this video for a better understanding of what the surgeon does to treat these tears. Does removing part of the meniscus lead to long-term problems later in life? The meniscus acts as a shock absorber, so in theory, removing part of it would lead to more stress on the articular cartilage and bones. While there is no way to predict if a patient will develop later arthritis after a partial meniscectomy or how quickly, it is a potential concern. Despite this concern for long-term wear on the articular cartilage and subsequent arthritis, the inner torn fragment probably provides little protection to this cartilage either. Plus the pain is unlikely to improve without trimming that part out. Therefore patients often undergo surgery to relieve pain and get back to activities even if they could develop degenerative problems in later years or decades. Why does it seem to take so long to recover from the surgery? Despite the perception that the surgeon trims out the inner part of the tear and thus the source of the pain, the patient is not instantly better. It’s true that the majority of the pain disappears fairly quickly. But it takes time for the swelling of the knee to go down. It also takes time to regain full motion and strength. The surgeon typically allows the patient to resume activities fairly quickly. After all, the patient is unlikely to do more damage to the meniscus by walking on it and starting exercise programs. Unfortunately it can take several weeks or even months to actually be able to resume exercise, especially repetitive impact, and return to the pre-injury level. Overall it can take 4-5 months before the patient is as good as he or she will be after a partial meniscectomy. Episode 187: Is playing tackle football at a young age risky?